הָעוֹמֶר שֶׁהֶחֱזִיק בּוֹ לְהוֹלִיכוֹ לָעִיר וּנְתָנוֹ עַל גַּב חֲבֵירוֹ וְשָׁכַח אֶת שְׁנֵיהֶם, הַתַּחְתּוֹן שִׁכְחָה וְהָעֶלְיוֹן אֵינוֹ שִׁכְחָה. רבי שִׁמְעוֹן אוֹמר שְׁנֵיהֶם אֵין שִׁכְחָה, הַתַּחְתּוֹן מִפְּנֵי שֶׁמְּכוּסֶּה וְהָעֶלְיוֹן מִפְּנֵי שֶׁזָּכָה בּוֹ. Mishna Peah 6:3 states that if a farmer took a sheaf from his field in order to bring it with him to the city, and while he was still in the field he put that sheaf down on the ground and forgot it there, then both Bet Shammai and Bet Hillel agree that it is not considered to be Shikcha. As I already explained above (see Tosefta Peah 3:6, notes 1 and 8 ) the Mishna argues on the opinion of Rebbi Eliezer stated in the previous Tosefta, according to whom Bet Shammai and Bet Hillel argue in this case, with Bet Shammai holding that it is not considered to be Shikcha, because the owner acquired it for himself and the sheaf now has to be treated as a private lost object, whereas Bet Hillel say that it is considered to be Shikcha due to a fine that the Rabbis imposed upon the farmer for taking the sheaf before it was stacked and thus preventing the poor from having a chance of getting it. This Tosefta discusses a similar case, but which involves two sheaves. Both opinions in the Tosefta, of the Tanna Kama and of Rebbi Shimon, follow the opinion of the Mishna that Bet Hillel agree to Bet Shammai that the sheaf that was acquired by the farmer is not considered to be Shikcha, because the farmer already acquired it for himself. If this Tosefta would have followed Rebbi Eliezer’s opinion from the previous Tosefta then at least one opinion in this Tosefta would have to hold like his version of Bet Hillel, namely that the top sheaf is considered to be Shikcha. Since they do not they must subscribe to the Mishna’s opinion of what Bet Hillel hold. Obviously, none of the Tannaim in our Mishna can hold like Bet Shammai since we always follow the opinion of Bet Hillel, besides 9 exceptions. See Talmud Bavli (Eruvin 13b) and (Berachot 51b). For the list of exceptions see Tosafot (Sukkah 3a, Deamar) where 6 of them are mentioned and Talmud Yerushalmi (Kilayim 8:4, Daf 39a-b), which mentions the other 3. This Tosefta can be used to prove the opinion of scholars, including myself, who argue that the Tosefta was written after the Mishna as an addition to it. And therefore even though it cited dissenting tradition from what was stated in the Mishna, it still commented on what the Mishna said, even if it was in conflict with the tradition cited by the Tosefta itself. If the Tosefta was written before the Mishna then it would make sense for this Tosefta to follow Rebbi Eliezer’s opinion from the previous Tosefta, since in that Tosefta it was the preferred opinion. However, the Tosefta chose not to follow it and instead to follow the Mishna’s opinion. This indicates that despite the fact that the Tosefta quoted dissenting tradition from the Mishna (i.e. in the previous Tosefta) it did not have a problem commenting on the Mishna in the next Tosefta (i.e. this Tosefta), which it could have done only if it was written after the Mishna. For the discussion of various scholarly opinions on what came first, the Mishna or the Tosefta, see Shamma Yehudah Friedman, Tosefta Atikta: Masechet Pesach Rishon, Bar Ilan University Press, Ramat Gan, 2003, Introduction, pp. 15-95. For the purpose of this discussion the Tosefta, as well as the Mishna, assume that the farmer lives in the city, and therefore he took the sheaf with him home. “His friend” refers to the sheaf’s friend and not the farmer’s friend, therefore meaning another sheaf. The phrase “his friend” commonly appears throughout the Talmudic literature referring to either two people who interact with each other or to objects which are similar to each other. The top sheaf is not considered to be Shikcha, because the farmer acquired it for himself, thus making it a lost object, as I already explained above in Tosefta 3:6, note 8. However, the bottom sheaf is treated as if it was forgotten by itself since it never received any special status by the farmer acquiring it. It is no different than any other forgotten sheaf in the field. Rebbi Shimon agrees with the Tanna Kama regarding the top sheaf not being Shikcha due to it being acquired by the farmer. However, he argues about the bottom sheaf. He says that in order for a sheaf to be considered Shikcha it has to be visible by the farmers who are working in the field. If the sheaf is somehow obscured from vision then it cannot be considered Shikcha, since the farmer left it in the field, not because he genuinely forgot it, but because he could not see it when he was collecting the sheaves to be stacked. It seems to me that Rebbi Shimon holds this purely based on logic. When the Torah gave the forgotten sheaf to the poor it intended to give the farmer a fair chance to collect all of the sheaves from the field and if he forgot it due to him not being careful then the sheaf belongs to the poor. However, if the farmer was at a disadvantage regarding the collection of the sheaves and some sheaves were obscured from his vision by something else, then in that case the Torah did intend to give them over to the poor, but rather they still belong to the farmer. However, the Tanna Kama does not subscribe to the same logic and holds that it does not really matter why the farmer forgot the sheaf. As long as the sheaf has been truly forgotten it is considered to be Shikcha. Other commentators, such as Higayon Aryeh, Minchat Yitzchak and Chazon Yechezkel, suggest that the reason for Rebbi Shimon’s opinion is a direct exegesis from the Torah, as quoted by a Beraita in Talmud Bavli (Sotah 45a). The Beraita quotes an argument between Rebbi Yehuda and the Chachamim (Sages) regarding a forgotten sheaf that has been hidden from view by something. Rebbi Yehuda holds that it is not Shikcha and the Chachamim hold that it is Shikcha. 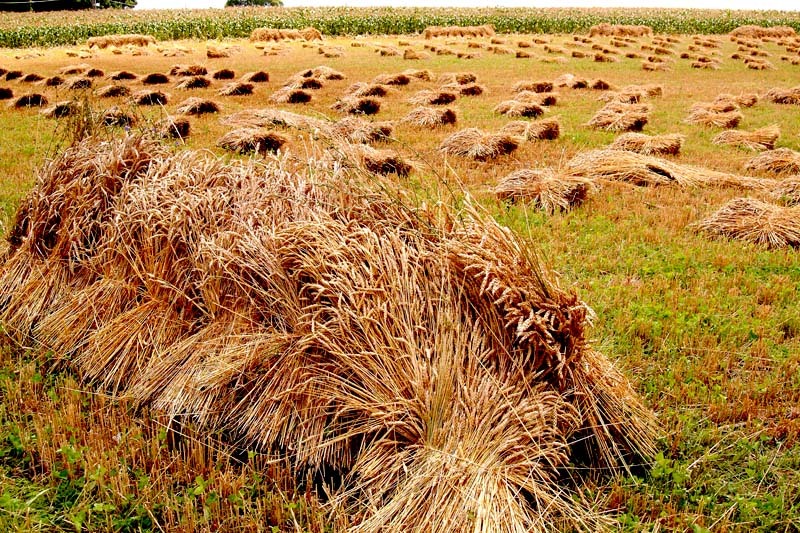 The Gemara explains that the reason for Rebbi Yehuda’s opinion is the fact the Torah says (Devarim 24:19) “When you harvest your harvest in your field and you will forget a sheaf …” implying that the sheaf has to be visible in the field just like the rest of the harvest and not obscured. However, the Chachamim disagree, and say that since in the same verse there are two different words, namely “your harvest” and “your field”, both of which imply that the sheaf has to be visible, then we use a technique called Miyut Achar Miyut, An Exclusion After and Exclusion, which actually includes the presumably excluded case. So since the presumably excluded case would be a hidden sheaf, then since the verse said two separate words both of which imply that it should be excluded from the law of Shikcha, we apply the rule of Miyut Achar Miyut and consider this case included into the law of Shikcha. The Gemara continues to ask that if that is so then how come Rebbi Yehuda does not use this rule here as well, and it explains that he needs the second word, “in your field”, to learn a different law. After that source for the law is rebuffed by the opinion of the Chachamim the Gemara is forced to conclude that Rebbi Yehuda simply does not subscribe to their opinion, because the wording in their exegesis does not make sense to him. Since Rebbi Yehuda’s opinion for the obscured sheaf is the same as Rebbi Shimon’s in our Tosefta the commentators use it to explain his view. Also, Talmud Yerushalmi (Sotah 9:2, Daf 41a) directly suggests that perhaps Rebbi Shimon learns out this law from the wording of the verse in the Torah as the Beraita quoted in Talmud Bavli. However, the Yerushalmi rejects that explanation due to the Miyut Achar Miyut that I already explained and implies that Rebbi Shimon would subscribe to it as well as the Tanna Kama, not as concluded in Talmud Bavli. This implies that the Yerushalmi rejects this explanation of our Tosefta. Since the discussion in the Bavli is forced and used to explain a few unrelated Beraitot and opinions, which are not necessarily connected, I have decided to stick with my explanation that the argument between Rebbi Shimon and the Tanna Kama is based on logic and not on Biblical exegesis. As I already explained earlier on a few occasions we are only concerned with whether the poor are allowed to take the sheaf if they see that he sheaf is obscured from vision by another sheaf or by something else lying on top of it. According to Rebbi Shimon they would not be allowed and according to Tanna Kama they would be allowed. We do not care what the farmer can do with this sheaf since he forgot about it and does not even know that it is there. אָמַר רבי אִלְעַאי, שָׁאַלְתִּי אֶת רבי יְהוֹשעַ, עַל אֵילוּ עוֹמָרִין נֶחְלְקוּ בֵּית שַׁמַּאי ובית הילל? אָמַר לִי, הַתּוֹרָה הַזּאת, עַל הָעוֹמר סָּמוּךְ לַגַּפָּא וְלַגָּדִישׁ לַבָּקָר וְלַכֵּלִים וּשַׁכְחוֹ. וּכְשֶׁבָּאתִי וְשָׁאַלְתִּי את רבי אליעֶזֶר אָמַר לִי, מוֹדִים בְּאֵילּוּ שֶׁאֵין שִׁכְחָה. עַל מָה נֶחְלְקוּ? עַל הָעוֹמֶר שֶׁהֶחְזִיק בּוֹ לְהוֹלִיכוֹ לָעִיר וּנְתָנוֹ בְּצַד הגפה וּבְּצַד הגָּדֵר וּשְׁכָחוֹ, שֶׁבֵּית שַׁמַּאי אוֹמרים אֵין שִׁכְחָה מִפְּנֵי שֶׁזָּכָה בּוֹ, וּבֵית הִלֵּל אוֹמְרים שִׁכְחָה. וּכְשֶׁבָּאתִי וְהִרְצֵיתִי דְּבָרִים לִפְנֵי רבי אלְעָזָר בֶּן עָזַרְיָה אָמַר לִי הַתּוֹרָה אֵילּוּ דְּבָרִים שנֶאֱמְרוּ למשה בסִּינָי. Mishna Peah 6:2 states an argument between Bet Shammai and Bet Hillel, 2nd generation Tannaim, regarding a case where the farmer forgot a sheaf in the field next to a stone fence, or a stack, or plowing cattle, or plowing tools, if it is considered to be Shikcha or not. Bet Shammai say that it is not Shikcha and Bet Hillel say that it is Shikcha. Mishna Peah 6:3 states that both Bet Shammai and Bet Hillel agree in the case where the farmer took a sheaf with him home to the city meaning to keep it for himself and then forgot it on the road, that it is not considered to be Shikcha. Our Tosefta adds an important detail that the statements in these two Mishnayot were actually disputed by 3rd generation Tannaim. The Mishna only quotes Rebbi Yehoshua’s opinion regarding this argument. However Rebbi Eliezer had a tradition that the argument between Bet Shammai and Bet Hillel was the opposite of what is stated in the Mishna. According to him they agree regarding the sheaf in the field discussed in Mishna Peah 6:2 and they disagree regarding the sheaf that the farmer took home to the city. It is interesting to see that the Tosefta says that Rebbi Elazar Ben Azaryah, who was the Nassi (president) of the Sanhedrin in Yavneh, preferred Rebbi Eliezer’s opinion and not Rebbi Yehoshua’s as the Mishna does. Obviously by the time of the 6th generation of the Tannaim, Rebbi Yehuda Hanassi, the compiler of the Mishna, had a different preference, the reasons for which I will discuss below. Rebbi Ilai, the father of the more famous Rebbi Yehuda, flourished in the second half of 1st century CE, during the period when the Sanhedrin (High Court) was in Yavneh. It seems from this Tosefta that his main teacher was Rebbi Eliezer (full name: Rebbi Eliezer Ben Hyrcanus) and not Rebbi Yehoshua (full name: Rebbi Yehoshua Ben Chananyah) since he chose to repeat his opinion to Rebbi Elazar Ben Azaryah, who most probably was the Nassi (president) of the Sanhedrin during this period, which is why Rebbi Ilai boasted Rebbi Eliezer’s opinion specifically to him and not to some other member of the Sanhedrin. See Talmud Bavli (Berachot 28a) for the description of the incident of Rabban Gamliel’s II removal from the post of the Nassi and the appointment of Rebbi Elazar Ben Azaryah. Rebbi Yehoshua was the Av Bet Din (Vice-President) of the Sanhedrin (see Talmud Bavli (Bava Kama 74b)), and he was much older than Rebbi Elazar Ben Azaryah, since he was from the previous generation, which most probably why Rebbi Ilai went to him first, out of respect for his position and age. Then he went to Rebbi Eliezer who was his main teacher and was of the same generation as Rebbi Yehoshua, but did not hold any special position. Finally he went to the Nassi of the Sanhedrin, Rebbi Elazar Ben Azaryah, so he can decide whose opinion he prefers. I would like to suggest that Rabban Gamliel was deposed from his office of the Nassi and Rabbi Elazar Ben Azaryah was appointed in his stead sometimes during the years 96-97 CE. There is a theory that Rabban Gamliel made two separate trips to Rome, once in 96 CE during the reign of emperor Domitian and the second time in 97 CE during the reign of emperor Nerva. See Shmuel Safrai, “Bikureihem Shel Chachmei Yavneh Beroma”, Sefer Hazikaron Leshlomo Umberto Nachon, Yerushalayim, 5738, pp. 151-167. (שמואל ספראי, ‘ביקוריהם של חכמי יבנה ברומא’. ספר זכרון לשלמה אומברטו נכון, ירושלים תשל”ח, עמ’ 151-167.) The first trip in the year 96 CE did not include Rebbi Elazar Ben Azaryah on the delegation. That delegation consisted of Rebbi Eliezer Ben Hyrcanus, Rebbi Yehoshua Ben Chananyah, and Rabban Gamliel. From the order of the people listed it would seem that Rebbi Eliezer was in charge, because he was the oldest. See Talmud Yerushalmi (Sanhedrin 7:13, Daf 41a) and Devarim Rabbah 2:24. This trip took place in the last year of Domitian’s reign when he declared various decrees against all Jews and Christians, who were seen by the Romans as a Jewish sect, in the Roman Empire. See Eusebius, Church History, Book III, Chapter 17. It is not clear what was the initial intended purpose of the trip, but most probably the Rabbis went to try to get the emperor to stop the persecution of the Jews. As mentioned in Devarim Rabbah (ibid.) the delegation of Rabbis tried to arrange for these laws, which lasted only about a month, to be rescinded with the help of a Roman senator (סנקליטוס (Sinklitos, plural: Sinklitin) which comes from the Greek word σύγχλητος (Sugklitos), meaning “a councilor”) and his wife. The Midrash does not tell us his name. However, according to the Roman historian Dio Cassius this official was the consul Titus Flavius Clemens and his wife Flavia Domitilla, who was the granddaughter of Emperor Vespasian and the cousin of emperor Domitian. The consul was executed and his wife was exiled to the island of Pandataria for “following of Jewish customs”, which probably means that they converted to Judaism. See Dio Cassius, Roman History LXVII, 13. As a result of Clemens’ execution, Domitian was assassinated by Clemens’ servant Stephanus on September 18, 96 CE. See Suetonius, De Vita Caesarum, “Life of Domitian”, 17. Once Domitian was killed his decrees against the Jews were abolished. The delegation of Rabbis returned to the Land of Israel either right before or right after Domitian’s assassination. It has been suggested by Safrai and others, although there is no direct source in Talmudic literature for this, that the second trip to Rome was made after the assassination of Emperor Domitian, during the reign of Emperor Nerva, in the year 97 CE, since Nerva died from a stroke on January 28, 98 CE, the day of a solar eclipse, and the tip could not take place in 98 CE. See Epitome de Caesaribus 12.12. This time the delegation was led by Rabban Gamliel and included Rebbi Yehoshua Ben Chananyah, Rebbi Elazar Ben Azaryah and Rebbi Akiva. See Sifri Ekev 43 and Shemot Rabbah 30:9. The reason for the suggestion that this second trip took place during Nerva’s reign, because Nerva abolished the Jewish tax, Fiscus Judaicus, of two drachmas, established by Vespasian in 70 CE on all Jews in the Roman Empire which was used to raise money for the Temple of Jupiter Capitolinus in Rome instead of the Half Shekel tax that all Jews used to pay to the Second Bet Hamikdash (Temple) before it was destroyed. See Josephus, Jewish War, 7,6 and Dio Cassius LXVI, 7. Nerva issued a coin that stated Fisci Iudaici Calumnia Sublata – The Disgrace of the Jewish Tax Removed. Sestertius issued by Emperor Nerva (RIC II 58) from the year 96 CE. Obverse: IMP NERVA CAES AVG P M TR P COS II PP. Reverse: FISCI IVDAICI CALVMNIA SVBLATA S C, around a palm tree. It is hard to know the exact purpose of the trip. It is most probable that the Rabbis went to win favor with the new emperor after they heard that Nerva was sympathetic to Jews and abolished the Jewish Tax as soon as he came to power in September 96 CE. If the two trip theory is correct then Shmuel Safrai (Safrai, ibid.) is wrong in suggesting that Nerva abolished the tax due to the Rabbis delegation’s influence, since by the time they showed up in Rome the tax was already long abolished. We know this from dates when Nerva issued coins that stated such. The earliest coin with the statement Fisci Iudaici Calumnia Sublata was issued still in 96 CE, about 6 months before the Rabbis showed up in Rome. See Roman Imperial Coinage Catalog (RIC), Volume II, 58. We also know that the second trip took place on Sukkot. See Sifra Emor 16:2, Tosefta Sukkah 2:13, Talmud Bavli (Sukkah 23a and 41b). It is really unlikely that this Sukkot was in the year of 96 CE, since Domitian was assassinated on September 18, 96 CE and it took 46 days for the official Roman courier of Cursus Publicus, Roman Messenger System, to travel from Rome to Caesarea in the Land of Israel. See James Hastings, “A dictionary of the Bible: dealing with its language, literature, and contents, including the Biblical theology,” Volume V Supplement, 1898, entry Roads and Travel (in NT), p. 387. This means that he would have arrived at the earliest on December 4, 96 CE. Even if we assume that the delegation of Rabbis took off on the next day after receiving the news, it is impossible that Sukkot that year fell out on December 5th, which is extremely late, even though the set calendar was not in place yet and each month was proclaimed after witnesses testified about their siting of the moon. See Mishna Rosh Hashanah 1:6. This means that they traveled only on the following Sukkot in the year 97 CE. It is most probable that they were on the ship on Sukkot on their return to the Land of Israel for a couple of reasons. Rabban Gamliel bought himself a Lulav bundle for Sukkot for 1000 denarii and he was the only one who had a Lulav on that trip, because he was the only one who could afford such a huge price. See Talmud Bavli (Sukkah 41b). The most probable reason that he had to pay such an exorbitant price for a Lulav is because he was ripped off by the Non-Jewish seller who was probably knew that Rabban Gamliel was rich and desperate and the seller was the only one around who had the whole bundle in stock. This could have only occurred outside of the Land of Israel, since in Israel they would have found plenty of Lulav bundles for a regular price. This means that they were traveling from abroad back home and not vice-versa. Also we know that they spent a Yom Tov in Rome. See Tosefta Beitza 2:8. Since they only found out the news of Nerva becoming emperor at the earliest in December 96 CE, they did not leave the Land of Israel until the spring of 97 CE when sea travel was possible. On Pesach of 97 CE they were already in the middle of their trip on the ship. See Mishna Maaser Sheni 5:6 (that it was Erev Pesach) and 5:9 (that they were on the ship traveling). This would mean that the Yom Tov that they spent in Rome was Shavuot of 97 CE. We also know that Rebbi Elazar Ben Azaryah only held the position of the Nassi by himself for a very short period of time, probably a few weeks, or at most a few months, and soon after Rabban Gamliel was reinstated as the Nassi, while Rebbi Elazar Ben Azaryah got to keep the same office on an alternating basis. Rebbi Elazar Ben Azaryah held it for 1 week out of the month and Rabban Gamliel for 3 weeks out of the month. See Talmud Bavli (Berachot 28a). Since in the fall of 96 CE Rabban Gamliel was still in Rome on his first trip he could not have been deposed until he came back. By Sukkot of 97 CE Rabban Gamliel and Rebbi Elazar Ben Azaryah already shared the office of the Nassi, which is why they took the second trip together. This brings us to the conclusion that the discussion that is described in our Tosefta took place sometime between the fall of 96 CE and the fall of 97 CE. It should be noted that there is a story in Talmud Bavli (Avodah Zarah 10b) which conflicts the two trip theory and implies that really there was only one long trip and the various Beraitot did not preserve perfectly the exact names of Tannaim who went on it. The story mentions that there was a Roman official whose name was Ketiyah Bar Shalom who advised a cruel Roman emperor not to destroy the Jews. As a result the emperor ordered him to be executed. Prior to his execution a Roman noble woman told him that he should circumcise himself before he dies, which he did. Right before his death he left all of his possessions to Rebbi Akiva as an inheritance. This story clearly resembles the story in Devarim Rabbah 2:24 about the senator who tried to protect the Jews and as a result was executed. There the senator also circumcised himself prior to his execution. The name Ketiyah also implies that he was posthumously named so by the Jews for being circumcised since קטיעה (Ketiyah) means “the cut one”. Another parallel between these two stories is that both of them mention a phrase which was exclaimed by the Roman woman either as a reply to the Rabbis about what they are thinking (according to Devarim Rabbah), or while trying to convince the senator to circumcise himself (according to Talmud Bavli), “the ship has left the port, but did not pay the tax”, referring to the senator being executed, but not circumcising himself. The Beraita in Devarim Rabbah does not mention Rebbi Akiva or that the senator left him all of his money. However, if we assume that these two stories are different versions of the same event, then it would imply that Rebbi Akiva was there when it happened and was involved in conversations with the senator, which is why after being so impressed by him the senator left him all of his money. Since this event took place during Domitian’s reign as we already proved, that means that Rebbi Akiva was there on the first trip as well. If we assume that the Beraitot did not preserve the names of the Rabbis involved accurately then we can argue that really there was only one trip, which began in 96 CE during Domitian’s reign and ended in 97 CE during Nerva’s reign. This would mean that the Rabbis were instrumental in convincing Nerva to abolish the Jewish Tax, since they were for sure there when he did it. This version however poses a slight difficulty of when could they possibly been traveling on a ship during Sukkot, since during Sukkot (September – October) of 96 CE they had to be in Rome since that is when Domitian was assassinated and Nerva became emperor. It is possible that they stayed in Rome until the fall of 97 CE and traveled back to the Land of Israel during Sukkot, but it is unclear why they needed to stay in Rome for so long. It would make more sense for them to come to Rome sometime during the summer of 96 CE and leave as soon as the winter of 96-97 CE was over, thus traveling back home during Pesach of 97 CE. By then Nerva has abolished the Jewish Tax and other Domitian’s anti-Jewish decrees, and the Rabbis work in Rome was done. The fact that they happened to be on a ship both during Pesach (spring) and during Sukkot (fall) as I already mentioned based on different Beraitot poses a difficulty in the chronology of a single trip. However, it is possible that Sukkot fell out late that year, sometime in the end of October, and the Rabbis have succeeded in convincing Nerva to abolish Domitian’s decrees and the Jewish Tax, and they started their journey back to the Land of Israel right before Sukkot at the end of October 96 CE. If that is the case, then they came to Rome right after Pesach 96 CE and spent Pesach on the ship on their way to Rome. If we follow the one trip theory then there is no way to know the exact year when Rebbi Elazar ben Azaryah became the Nassi, since he already was the Nassi by the time of this trip and we do not know an earlier date when he for sure was not the Nassi. However, I am inclined to believe more the two trip theory, mainly because it fits much better with all of the other Beraitot. The one Beraita about Ketiyah Bar Shalom leaving all of his money to Rebbi Akiva may be an anomaly which mixed up some facts. It is also important to note that that Beraita is of much later, Babylonian, origin than all the other Beraitot mentioned, since this Beraita is written in Babylonian Aramaic, whereas all the other Beraitot are written in Mishnaic Hebrew and many of them appear in earlier sources than the Babylonian Talmud, such as the Mishna or the Tosefta. It is possible that this later Beraita simply due to oral transmission for a much longer period of time has either confused Rebbi Akiva with a different Tanna or confused the story of the senator who got executed with a story of another Roman official converting to Judaism, which did not take place in Rome during the events that I have described. Also, in Talmud Bavli (Nedarim 50a-b) there is a Babylonian Aramaic Beraita which mentions multiple stories about how Rebbi Akiva became rich, most of which are legends, and the story of Ketiyah Bar Shalom is listed among them. This also points to the fact that this particular story should not be taken in an exactly historical context. It is clear from this Tosefta that since the beginning of the 1st century CE, which were the early days of Bet Shammai and Bet Hillel schools, there was an oral tradition regarding them arguing about certain cases of sheaves being Shikcha or not. However, as time went on this tradition became partially forgotten. We can figure out how long this oral tradition has been past for prior to the discussion mentioned in our Tosefta. Hillel the Elder became Nassi of the Sanhedrin in the year 30 BCE, 100 years before the destruction of the Temple, which was in the year 70 CE. See Talmud Bavli (Shabbat 15a). Hillel was the leader of the Jewish people (i.e. Nassi) for 40 years until his death. See Sifri Devarim 357. This means that he died in the year 10 CE. That means that Bet Hillel as a separate entity without Hillel himself came into existence with Hillel’s death in the year 10 CE. Both schools as entities ended either with the destruction of the Temple or very soon after. Rabban Yochanan Ben Zakkai who established the Sanhedrin in Yavneh in the year 70 CE, was himself a student of Hillel, under whom he studied as a young man. See Talmud Bavli (Sukkah 28a) and Sifri Devarim 357 (where it is mentioned that he died being 120 years old just like Hillel the Elder himself). Rebbi Eliezer Ben Hyrcanus who was a student of Rabban Yochanan Ben Zakkai (see Mishna Avot 2:8) and who was an old man when the conversation in our Tosefta took place was considered to be a student of the school of Shammai, not because he learned under Shammai the Elder, since he was too young for that, but because he sympathized with Bet Shammai’s opinions. See Talmud Yerushalmi (Terumot 5:2, Daf 28a; Beitza 4:7, Daf 19a; Sukkah 2:8, Daf 11a-b; Sheviit 9:6, Daf 27a; Nazir 6:11, Daf 32b) and Tosafot (Niddah 7b, Shamuti Hu). This implies that this school ceased to exist sometime during his lifetime as well. If the assessment of the timing of the conversation in our Tosefta discussed in the previous note is correct that it took place in 96 – 97 CE, then most probably the oral tradition of this argument has existed for at about 80-85 years, assuming that the original argument took place soon after the death of Hillel. Rebbi Yehoshua exclaimed this oath, because he wanted to emphasize that he is stating a true oral tradition which he has received from his teachers, and he is not merely saying this based on logic. The word גפא (Gaffa), sometimes spelled גפה, is very difficult to translate. There are various opinions about its etymology and definition. Most Rishonim (Medieval Commentators) seem to imply that its etymology comes from the Hebrew root גיף (Gif), which means “to close”, as used in the verse in Nechemya 7:3. However, even though they agree on the etymology, they disagree regarding its meaning. The Rambam in his commentary on the Mishna (Peah 6:2) says that it is a gate. The Rash Mishantz and Mahari Ben Malki Tzedek in their respective commentaries on the Mishna (Peah 6:2) say that it is a stone fence made out of piled stones without any type of cement binding them together. Rashi (Bava Metzia 25b, Matza Achar Hagafa, Gader) says that it is a patch in a wooden or reed fence, but specifically not a stone fence. Eliezer Ben Yehuda in his dictionary says that it is a hedge, meaning a natural fence made out of growing reeds or bushes, as opposed to a fence made out of cut wood. He does not think that the etymology from the verse in Nechemya is correct, however, he does not seem to provide any conclusive evidence for his translation. See Eliezer Ben Yehuda, “Milon Halashon Haivrit Hayeshana Vehachadasha”, Vol. 2, p. 825, entry גפה, footnotes 4-5. Ben Yehuda’s translation resonates well with Rashi’s explanation, although Rashi does not limit it to a naturally growing hedge. Jacob Levy thinks that it is a cairn, a human-made pile of stones (in German: steinhaufen). See Jacob Levy, “Neuhebräisches und chaldäisches wörterbuch über die Talmudim und Midraschim”, Leipzig, 1876, Volume 1, p. 351, entry גפא I. This explanation resonates with Rash Mishantz’s explanation that it is a stone fence made out of piled stones. I have chosen to translate Gafa as hedge, since it makes most sense in this particular context, because fields are commonly divided up by hedges of bushes or reeds. Also this word is used in the Mishna a few other times together with the word Gader, fence, and other types of field divisors which implies that it is a type of a dividing line similar to a fence. See Mishna Bava Metzia 2:3 and Kilayim 2:8. 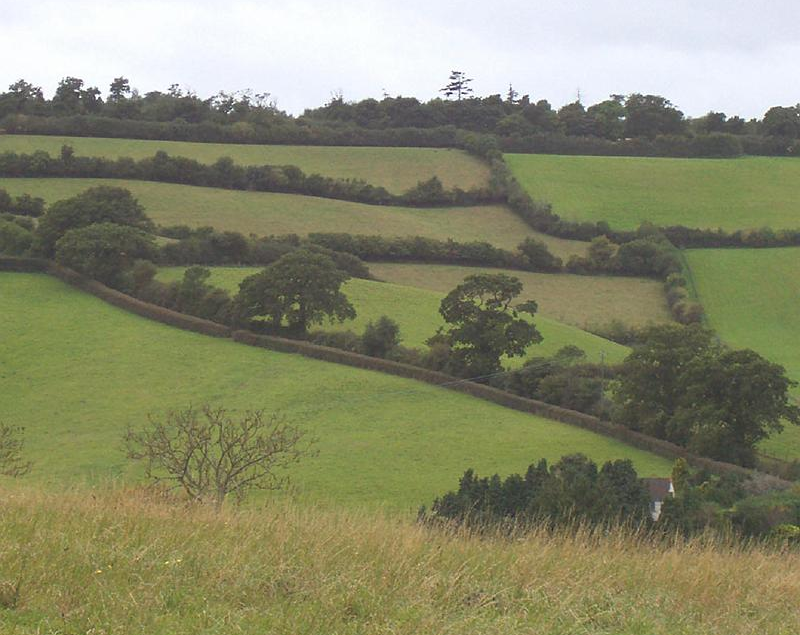 Hedges dividing up fields in South Devon, England. Photo: www.teignbridge.gov.uk. 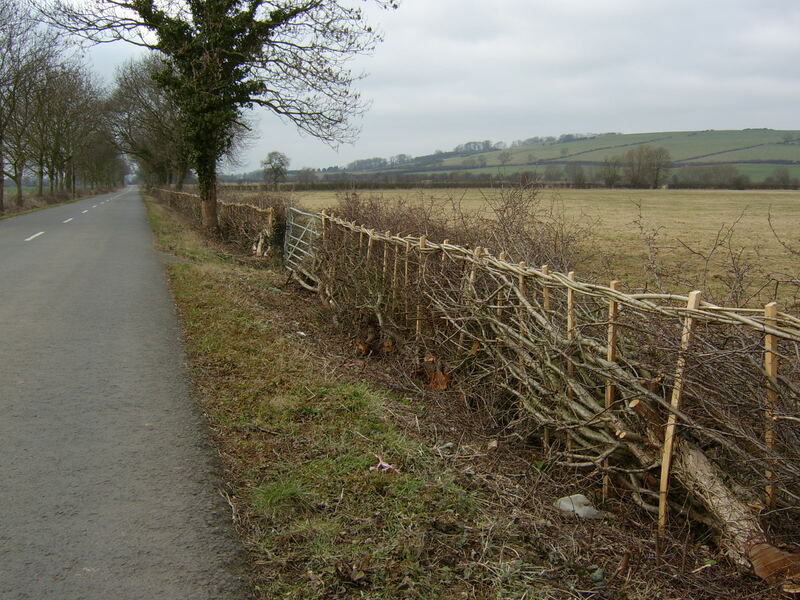 Man-made hedge laid from branches in Middleton, Northamptonshire, England. Before I explain the logic behind each opinion it is important to note that the concern behind this argument is whether the sheaf is considered to be Shikcha and therefore can be taken by the poor based on the circumstances. There is no way for the poor to know what the farmer truly intended to do with this sheaf. Did he put it next to the fence on purpose or did he drop it there by accident? Did he mean to take it to the city with him or did he mean to put it in the stack with all the other sheaves? No one knows this besides the farmer himself. Therefore the Rabbis have defined rules for such a sheaf based on the most common circumstances. All we are concerned with is, are the poor allowed to take this sheaf or not. If it is considered to be Shikcha then they are allowed, and if it is not considered to be Shikcha then they must leave it there so the farmer will eventually find it and pick it up himself. According to Rebbi Yehoshua in our Tosefta Bet Shammai hold that the sheaf forgotten near all of the above mentioned places is not considered to be Shikcha, because these places are all good enough markers to consider that the farmer put it there on purpose in order to take it later. The fact that he put it next to a fence or next to his farming tools proves that he put there not accidentally, but rather because he wanted to take it later for himself and not put it in the stack. And therefore this sheaf was not forgotten by the farmer in the process of bundling, but rather it is a personal lost item which cannot be taken by the poor, but rather needs to be left in the spot where it was forgotten for the farmer to eventually pick it up. It does not need to be returned to the farmer as a regular lost object, since it is lying in his private field and we assume he would eventually see it there and take it. However, Bet Hillel hold that all of these places are not specific enough markers that would indicate that the farmer put it there on purpose as something he intended to keep for himself, but rather we assume that it has merely been dropped there accidentally while it was being carried to the big stack and therefore it qualifies for Shikcha. It is important to reiterate that Rebbi Yehoshua’s opinion is not driven by logic, but rather by his tradition of the oral transmission of the case as it is apparent from his oath that it is correct. No one would swear, especially by the Torah, that his logic is better than someone else’s, but they would swear that his oral transmission of facts is accurate. Therefore there is no logical reason why Rebbi Yehoshua’s picks his opinion over Rebbi Eliezer’s, which leaves us only to explain the logic behind Bet Shammai’s and Bet Hillel’s opinions according to each case. According to Rebbi Eliezer, both Bet Shammai and Bet Hillel agree that all of the above mentioned places are specific enough markers that indicate that the farmer left it there on purpose in order to take it later for himself instead of piling it in the stack and therefore this sheaf does not qualify to be Shikcha. The key difference between this case and the first case is whether the poor know that the farmer took the sheaf for himself or not. In the Rebbi Yehoshua’s case they had no idea why the sheaf was lying by the fence. In Rebbi Eliezer’s case the poor know that the farmer put it by the fence on purpose, but later on they saw that the farmer left the field without taking this sheaf, indicating that he forgot it there and now they want to take it. Can they or not? It is obvious why Bet Shammai say that the sheaf that the farmer meant to take to the city with him and laid it down by the fence in the field in order to take it later, eventually forgetting it there, is not considered to be Shikcha, therefore not allowing the poor to take it for themselves. The farmer acquired the sheaf for himself and now it is his personal property that is not considered to be produce that is being bundled into a stack. After the farmer has put this sheaf aside for himself it has to be treated as a lost object and not as harvested produce. It is important to reiterate that gifts to the poor, such as Shikcha, belong to the poor at the moment that they qualify as gifts to the poor, as was already explained earlier, regardless if the owner designates them as such or not. See above Tosefta Peah 2:19, note 8. In this case, the owner specifically indicated that this sheaf is not a part of the harvest, but rather his personal property, therefore it cannot become a gift to the poor even if later on the farmer forgot it. It is more difficult to understand Bet Hillel’s logic in this case. If they agree to Bet Shammai in the first case that the sheaf that was simply forgotten by the fence without us knowing how it ended up there is not considered to be Shikcha then for sure they should agree in this case where it is known that the farmer specifically took the sheaf for himself to take to the city and put it next to the fence, that it should not be Shikcha and the poor are not allowed to take it. It seems to me that Bet Hillel considered this sheaf Shikcha precisely because we know that the farmer took it for himself, as a fine to the farmer. They hold that really the farmer should not pull out sheaves in the middle of the stacking process in order to keep it for himself, because that deprives the poor from their potential share of the gifts that they might get. Therefore Bet Hillel fined the farmer in this particular case and said that since we know for a fact that he intended to keep it for himself by taking it to the city, since now he forgot it in the field, the poor are allowed to take it as Shikcha. But not as Shikcha defined by Torah law, but rather as Shikcha defined as a Rabbinical fine. However, in Rebbi Yehoshua’s case Bet Hillel were not able to use this logic, because there no one really knew that the farmer really intended to keep this sheaf. All the poor saw that a sheaf was lying next to farming tools or a fence. May be the farmer put it there on purpose intending to either put it into the stack later on, or to take it to the city, or maybe he simply dropped it there by accident. We do not know, so we have to assume that it belongs to the farmer, but we cannot fine him since we do not know that he really committed some kind of violation. However, in Rebbi Eliezer’s case we know for sure that the farmer intended to keep for himself thus depriving the poor from a potential gift and therefore we are able to fine him. This logic implies that according to Bet Hillel, the Rabbis have forbidden for the farmer to actively remove sheaves from possibly becoming Shikcha. I do not have an explicit proof for such an enactment, but we do find that the Rabbis have enacted similar laws at least with regard to Leket (fallen stalks) where they wanted to make sure that at least there would be a possibility for the stalks to fall. See above Tosefta 2:3, note 4. The same argument can be used here that the Rabbis (at least in Bet Hillel’s opinion) wanted to make sure that the farmer gives a fair chance for some sheaves to be forgotten so that the poor will get them. 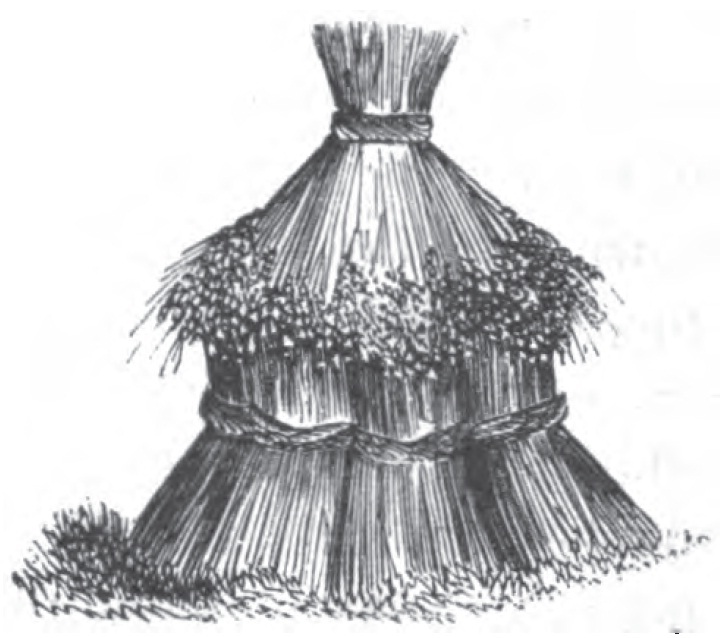 Removing sheaves prior to their bundling and setting them aside would make limit the amount of sheaves that can be legitimately forgotten during the bundling process which in turn would limit how much the poor would get in the end. Rebbi Eliezer ben Azaryah realized the brilliance of the logic in the argument according to Rebbi Eliezer and therefore exclaimed that his version of the case must be true. He really had no way of knowing which one of them had a more accurate tradition. All he could do is hear out both opinions and decide which one of them was more logically sound. Since Rebbi Eliezer’s version definitely had some sharper logic behind it he chose it to be the preferred case. The fact that he exclaimed that this is what was pronounced on Sinai follows along the Rabbis’ belief that all oral tradition of the Torah was pronounced on Sinai even arguments and enactments that took place later in history. See Talmud Yerushalmi (Peah 2:4, Daf 13a, and Megillah 4:1, Daf 28a) and Talmud Bavli (Berachot 5a). רבי יְהוּדָה אוֹמר הָעוֹשֶׂה כָּל שָׂדֵהוּ עוֹמָרִים ומְעַמֵּר לָהֵן, כִּמְעַמֵּר לַגָּדִישׁ וְהַדְרַה וזוֹרֵר לגדיש. מוֹדִים בֵּית שַׁמַּאי וּבֵית הִלֵּל שֶׁאִם הִפְקִיר לָאָדָם וְלֹא לַבְּהֵמָה, לְיִשְׂרָאֵל וְלֹא לַגּוֹיִם, הֶפְקֵר. The underlying reasons for the argument in the Mishna between Bet Shammai and Bet Hillel are discussed in Talmud Yerushalmi (Peah 6:1, Daf 28a-b). Either their argument depends on the verses in the Torah from which they learn out the concept of Hefker, or it depends on the technicality of how Hefker works in terms of leaving possession of the original owner and entering the possession of the new owner who picked it up. Regardless of the reasoning proposed it is clear from the Yerushalmi’s discussion that it was not aware of this Tosefta, because in it, Amoraim, Rebbi Yochanan and Rebbi Shimon Ben Lakish, both of whom lived in the generation after the Tosefta has been written, argue regarding the law of the cases cited in this Tosefta. They were clearly not aware that the Tosefta says that Bet Shammai and Bet Hillel agree about them. Therefore, the reasons for their argument cited in the Yerushalmi may not apply to this Tosefta, since according to those reasons Bet Shammai and Bet Hillel would not necessarily agree in the cases cited here. I have already discussed in Tosefta Peah 2:11, note 5, the reasons behind this argument, and I will not repeat them here. However, additional reasons need to be added as to why they agree in these two cases. The case of the animals is simple. Since there is no concept of possession by animals it is clear that not letting animals to take something does not in any way show that the item proclaimed ownerless only to people is not ownerless. The concept of ownership and ownerless can only apply to people. And therefore everyone agrees that if the owner made something Hefker and excluded animals from his declaration it makes no difference, and it is as if the owner included everyone possible to be included into his proclamation. Therefore the item remains Hefker with all of its implications. It is difficult to understand this second case, since Non-Jews, just like Jews, have a concept of possession in Torah law. See Talmud Bavli (Bava Metzia 47a). Even the concept of Hefker itself applies to a Non-Jew, since a Non-Jew himself can proclaim something ownerless and it will obtain that status, as was already stated in Mishna Peah 4:6 and Tosefta Peah 2:11. And therefore if the owner proclaimed something ownerless, but excluded Non-Jews from his proclamation, then the law should be exactly the same as if he has excluded a group of Jews, thus causing Bet Shammai and Bet Hillel to continue their argument in this case. One proposed solution to this problem was suggested to me by my wife, Rachel, and is also mentioned by Noda Beyehuda (Mahadura Kama, Even Haezer 59), although rejected by him, that the whole argument between Bet Shammai and Bet Hillel regarding partial proclamation of Hefker is not about the whole general law of ownerless property, but rather only about its agricultural implications. In other words, as long as the object that was made Hefker was produce then Bet Shammai and Bet Hillel argue whether it is considered to be Hefker or not regarding the obligation of the new owner of the produce to remove tithes from it. However, they agree that in all of these cases the produce can be picked up by anyone and they will not violate the prohibition of theft since its original owner relinquished his rights to this produce. They also do not argue regarding partial Hefker when the item in question is not produce and therefore there is no concern regarding tithes and would agree that it can be picked up by anyone without concern for violating prohibition of theft. According to this explanation it makes sense why they would agree that excluding Non-Jews from the ownerless declaration would still exempt this produce from Maaserot. Tithing, being a commandment in the Torah, only applies to Jews. Therefore as far as tithing is concerned all Jews, both poor and rich, and from all locations, have been included in the Hefker proclamation. And therefore this produce is Hefker with regard to tithes and is exempt from them. Excluding Non-Jews is like excluding anyone else who is not involved in the process of tithing, like animals. This explanation would raise an interesting question such as, what if the owner of the produce excluded all Jews who live outside of the Land of Israel where there are no tithes. Would Bet Shammai and Bet Hillel argue in this case or not? We do not know. Since Bet Shammai and Bet Hillel lived in the Land of Israel this question did not really concern them and they did not discuss it. Or even if they did it has not been recorded for us. Although this explanation makes some sense, because it appears in tractate Peah where generally only agricultural questions are discussed, I would like to reject it, just like the Noda Beyehuda did, for the following reasons. First of all the Mishna in its language does not mention Maaser at all. It makes a blank statement regarding the general concept of Hefker implying that the subject under discussion is the actual ownerless status of the object and not only whether Maaser needs to be removed from it or not. It also does not mention produce, but rather implies that this argument would apply to any object that was declared to be ownerless even if it is not produce. Finally, this understanding has precedence. The Mishna has been understood this way by everyone who read it, starting from the Amoraim in Talmud Yerushalmi and ending all of the commentators on the Mishna, both early and late. And although the fact that everyone understood it a certain way is not a reason to reject a particular explanation, I believe that they were right due to the other reasons that I have already mentioned. And on this principle it seems quite true to say also, that if a thing is regarded by its owner as abandoned, then any one that takes possession forthwith becomes its owner. And it is regarded as abandoned when its owner has thrown it away with the intention that it shall no longer be part of his property; he ceases, therefore, at once to be the owner. Translation from William Alexander Hunter, “A systematic and historical exposition of Roman law in the order of a code”, 4th ed., translated by John Ashton Cross, London, 1803, pp. 257-258. In fact, Roman law in general always required an act to accompany intention, not just with regard to relinquishing property, but also with regard to crimes, as well as possession. Justinian’s Code, Corpus Juris Civilis, compiled to from 529 to 534 CE, claimed to compile all Roman civil law from the time of Hadrian (76 – 138 CE) until its day, and therefore it is safe to assume that the same Roman law was active during the times of Bet Hillel and Bet Shammai, who mostly flourished during the 1st century CE. Based on all of this, it would seem that according to Roman law if a person threw something away and declared it ownerless to some part of the population, he could not proclaim that a different part of the population could not take possession of that object, because the act of throwing away already showed that the owner relinquished all of his rights to the object. I would like to suggest, that Bet Hillel and Bet Shammai, being aware of this Roman law, decided to judge the Non-Jew, who in their case was a Roman, according to his own laws. And therefore when a Jew made a declaration of Hefker that excluded Non-Jews, since such a declaration had no validity in a Roman court, they decided that it would make sense to ignore it as well, just like the Roman court would, and therefore still consider the object in question ownerless to everyone, just like it would have been done in Roman law. You may wonder, why would they do this? The answer to that is simple. The Rabbis’ concern was always to distance the Jews from the Non-Jews, in order to prevent intermarriage and idol worship, and since in this case there was a legal loop hole that allowed them to show the Jews that their act is not affected by the Non-Jews in any way, even if it is merely a thought or a proclamation, it sent a powerful message, that whatever the Jews do, the Non-Jews do not concern them and do not have any legal power to control their way of life. Bet Shammai and Bet Hillel agree that if [a person] proclaimed [his produce to be] ownerless [only] to people, but not to animals, [or only] to Jews, but not to Non-Jews, [it is still considered to be] ownerless [and anyone can come and take it]. מוֹדִים בֵּית שַׁמַּאי וּבֵית הִלֵּל שֶׁאִם הִפְקִיר לָאָדָם וְלֹא לַבְּהֵמָה לְיִשְׂרָאֵל וְלֹא לַגּוֹיִם הֶפְקֵר. Before explaining the Tosefta and the Mishna upon which it comments it is necessary to understand the terminology which the Tosefta and the Mishna use. Part of the problem that plagues all of the commentators, both on the Mishna and the Tosefta, is that they do not know the proper farming terminology or the process of bundling sheaves, stooking and stacking grain, which is being referred to here. I have translated all of the technical terms used in the Tosefta based on their definitions in the book by Sereno Edwards Todd, “The American wheat culturist: a practical treatise on the culture of wheat, embracing a brief history and botanical description of wheat, with full practical details for selecting seed, producing new varieties, and cultivating on different kinds of soil,” Taintor Brothers & Co., 1868. Before I go on explaining the text I would like to simply list the terms and their translations used in both the Tosefta and the Mishna to which it refers. עומר (Omer) – sheaf (plural: sheaves). מעמר (Meamer) – binding sheaves or heaping. This is a general term that means bundling and refers to binding a single sheaf, stooking, or stacking, depending on the context. Generally, it is referring to whatever the subject is that comes after the word Meamer. For example, if we say Meamer Letevuah, then Tevuah (grain) is the subject to which Meamer refers to and therefore the phrase means binding individual stocks of grain into sheaves. If the subject is sheaves, then it is referring to the next step in the process, namely bundling sheaves into stooks. If the subject is the final stack then we are talking about bundling sheaves from the stooks into the stack. מעמר לעומרים (Meamer Leomarim) – stooking individual sheaves into a stook or a small heap. מעמר לגדיש (Meamer Lagadish) – stacking sheaves from stooks into a stack. The first half of the Tosefta is related to Mishna Peah 5:8, which states that if a farmer makes sheaves of grain in order to pile them into various types of stooks that later on will have to be piled again into a large stack from where the grain will be taken to the threshing floor then if a sheaf is forgotten by the farmer while it is being piled into these stooks it is not considered to be Shikcha. However, if he piles the sheaves directly into a stack from where they will be taken to the threshing floor then it is considered to be Shikcha. The Mishna concludes with a general rule that regardless of what type of heap these sheaves are being piled into, either a stook or a stack, as long as this heap is the culmination of the act of heaping sheaves, עימור (Imur), meaning that it is the final heap prior to the grain being brought to the threshing floor, then all sheaves that are forgotten in the field while they are being carried to that final heap are considered to be Shikcha. However, if the sheaves are being carried from that final heap to the threshing floor or being carried to an intermediate heap then if they are forgotten at that time they are not considered to be Shikcha. Only if the sheaves or intermediate heaps are being transported to the final heap before the grain will be taken to the threshing floor, only then it is the last “trip” of the grain during the process of heaping, or bundling sheaves, which makes the sheaves qualify for Shikcha in case they are forgotten. But during any other step in the process, either before or after the final heaping in the field, the sheaves, if forgotten, do not qualify for Shikcha and can be picked up by the owner. Rebbi Yehuda in our Tosefta comes to argue on some details outlined in the Mishna regarding specific types of heaps. The second half of the Tosefta is related to Mishna Peah 6:1 in which Bet Shammai and Bet Hillel argue regarding the law of Hefker (ownerless items). Bet Shammai say that if the owner of the produce proclaims it to be ownerless only to poor people, thus preventing the rich from taking it, then it is still considered to be Hefker and is therefore exempt from Maaserot (tithes). See Mishna Chala 1:3. However, Bet Hillel say that if the owner puts such a limitation on its ownerless status then it is not considered to be ownerless, and therefore it is still obligated in tithes, unless the owner proclaims it to be ownerless to all people, even the rich. It seems from the Mishna that regardless of the limitation set in the proclamation of the owner anyone, rich or poor, would still be allowed to take that produce, even though it is not officially Hefker for them, since the owner gave up on it (Yiyush) and does not intend to keep it, as I already explained above in Tosefta 3:4, note 8. Our Tosefta comes to add an important clarification to this argument, that not all types of limitations set in the proclamation of the owner are the same, and that there are limitations that the owner can set to the produce’s Hefker status which will still qualify it as Hefker and therefore exempt the poor from tithing it. I would like to point out that the only reason I have bundled these two unrelated parts of the Tosefta into a single Tosefta is because that is the way it is recorded in the Talmud Bavli printed edition, whose numbering order I preserve in this edition of the Tosefta for ease of use. It would make more sense to separate these two parts into two separate Toseftot. There is no indication in any Tosefta manuscript how these Toseftot were meant to be numbered, because they do not have numbers and in this particular case these two statements are written together without any extra space between them. Another important point is that there is a discrepancy in the statement of Rebbi Yehuda between the Vienna and the Erfurt manuscripts, as well as between various commentators interpreting what is written in the manuscripts. I have chosen a reading in the main text which makes most sense based on context. I have quoted other reading possibilities in the commentary below as well as shown the pictures of how the text looks in both manuscripts so that the reader can understand the difficulty in its interpretation. Stooking, also known as shocking, is an act of stacking grain sheaves in the field before threshing so that they can dry. Normally the sheaves are stooked into stooks, also known as shocks, and left in the field to dry for a few weeks after which it is either taken to the threshing floor or if there is not enough room for all the grain at the threshing floor, it is stacked into a stack in the field where the grain remains until it is moved to the threshing floor once the rest of the grain has been threshed. The reason that farmers stored grain in stacks and not in barns or at the threshing floor itself, is because the threshing floor was not big enough to store all of the harvested grain and most poor farmers did not have closed silos. They simply stored the grain in stacks in the field until it could be threshed on the threshing floor. The details of stacking, as opposed to stooking, will be explained below in note 4. There is a whole methodology to stooking sheaves properly, because if it is not done right then the grain will not dry well. For more details on proper methods of stooking see Sereno Edwards Todd, “The American wheat culturist: a practical treatise on the culture of wheat, embracing a brief history and botanical description of wheat, with full practical details for selecting seed, producing new varieties, and cultivating on different kinds of soil,” Taintor Brothers & Co., 1868, pp. 366-381. Mishna Peah 5:8 lists a few different types of stooks, all of which are not considered to be the final step in the heaping process. Although it is impossible to identify exactly how each of these stooks looked at the time of the Mishna I have put together a list with pictures based on their descriptions which I believe is very close to the reality that the Mishna is referring to. כובע (Kova) – a stook that looks like a hat (hence it is called Kova – hat). 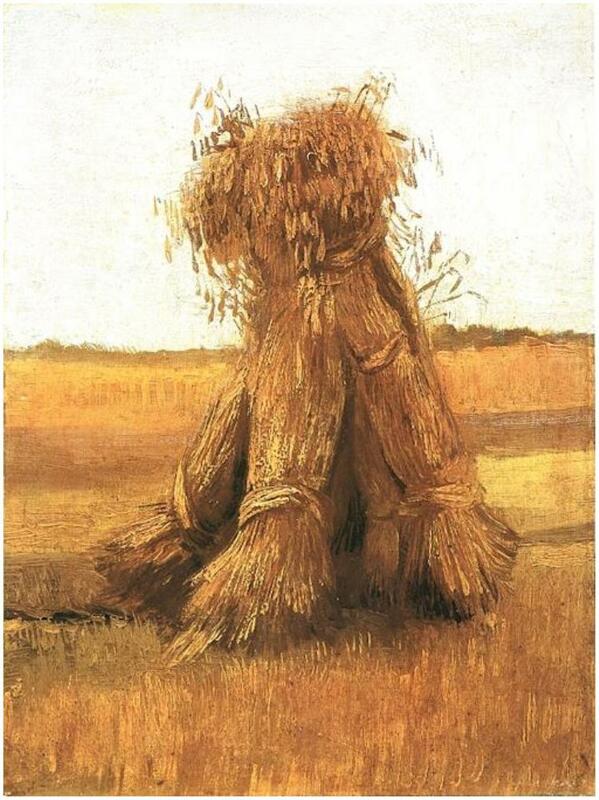 This is most probably the most common type of a stook where the sheaves are leaning against each other. It has a somewhat triangular shape. Hat shaped stooks. It is not the best way to stook sheaves, because they are not very stable and sometimes they fall down, as can be seen on this picture. Photo: hughlook. כומסה (Kumsa) – a round stook. Most commentators identify the source of the word Kumsa with the Hebrew root כמס (Kamas), which means “hidden”, implying that this is some kind of a heap beneath something else. Aruch Hashalem, Vol 4, entry כבע, p. 187, suggests that this may not be a native Hebrew word and may come from Arabic, specifically meaning “a round heap”. Both of these interpretations make sense for the standard round stook. The way a round stook is made is by placing a single sheaf in the center and then surrounding it by eight sheaves in a circle. The eight sheaves lean against the center sheaf thus giving the stook its stability. The name, Kumsa, refers to the “hidden” sheaf in the center of the stook, since it cannot be seen from the outside. Round stook. An instructional illustration from the 19th century. 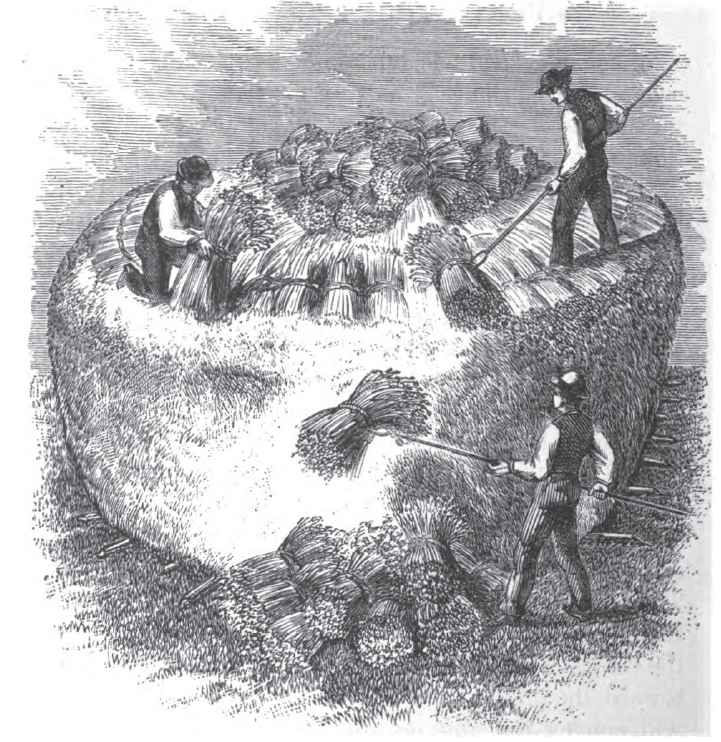 Note that the sheaves were put vertically in a circle and then another sheaf, called the capping sheaf, was put on top of them, so that in case it rains water would run down the stook and not collect inside. From The American Wheat Culturist, p. 370. חררה (Charara) – a stook with a hole in the middle. It comes from the word חריר (Charir) which means “a hole of a needle”, as used in Mishna Keilim 13:5, which in turn comes from the word חור (Chor), “hole”. See Aruch Hashalem, Vol 3, entry חרר, pp. 504 – 505. The way this stook would be made is the same as the Kumsa stook, except that instead of the hidden sheaf in its center there would be empty space. Also, the capping sheaf would not be placed on top of it since there was nothing in the center to support it. It is not clear what would be the advantage of making a round stook with a hole in the middle, except perhaps for the simplicity of making it. There probably was no real concern for rain water collecting inside the stook, since it almost never rains in the Land of Israel in the spring, during the harvest season. It is also possible that Charara is actually a rectangular stook and the hole is referring to the lack of the support sheaf in the stook’s center. In a rectangular stook the sheaves are placed in two rows and are leaning on each other, thus creating a hollow space in the center of the stook, which can actually be seen from the outside. Wheat Sheaves in a field, in Lancaster County, Pennsylvania, June 2004. Notice the small sheaves in the background all over the field and then the larger rectangular stooks in the foreground and the background. Notice that the sheaves in this rectangular stook are leaning on each other and do not have a central supporting sheaf. Photo: Curt Weinhold. Sheaves of Wheat in a Field. Painting by Vincent Van Gogh, 1885. Kröller-Müller Museum, Otterlo, Netherlands. Notice that this particular stook does not have a center sheaf and is therefore hollow in the middle. This is a possible depiction of a Charara. 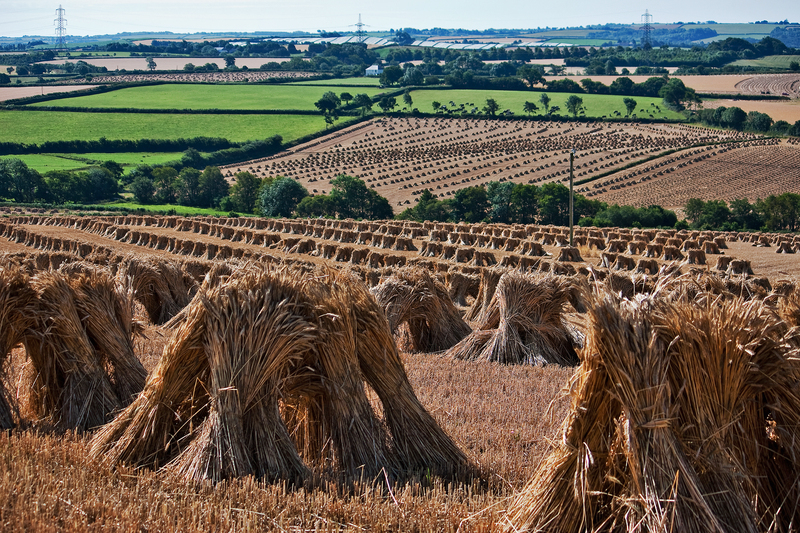 Stooks of wheat in fields near South Molton, England, July 2010. Notice that these stooks are hollow as well and do not have a sheaf in their center placed for support. Photo: Mark Robinson. Rebbi Yehuda describes the standard process of heaping in which the farmer first creates sheaves, then collects them and puts them into stooks, and then collects all the stooks into a large stack from where he will then take all the sheaves to the threshing floor. According to Mishna Peah 5:8 stooking is considered to be an intermediate step in the process of heaping and therefore if the farmer forgets one of the small sheaves while stooking them into stooks it would not be considered Shikcha, because it is not the final act of heaping. However, Rebbi Yehuda argues on the Mishna and states that in this case the forgotten sheaf would be considered Shikcha, as will be explained in the note 5. The Hebrew verb הדר (Hadar) means “to enclose” or “to round off”. It is referring to the act of smoothing out the final stack of grain. The stack has to be smooth so that in case that it rains the rain water will run-off the edges of the stack and will not collect inside the stack causing the grain to rot. There is a whole complicated methodology to stacking grain in stacks in order to make sure that the stack does not lean to the side, fall apart or become very wet. For more details on proper methods of stooking see Sereno Edwards Todd, “The American wheat culturist: a practical treatise on the culture of wheat, embracing a brief history and botanical description of wheat, with full practical details for selecting seed, producing new varieties, and cultivating on different kinds of soil,” Taintor Brothers & Co., 1868, pp. 389-399. Stacking wheat. An instructional illustration from the 19th century. Note that the individual sheaves are stacked in a way that the outside of final stack is smooth. From The American Wheat Culturist, p. 392. 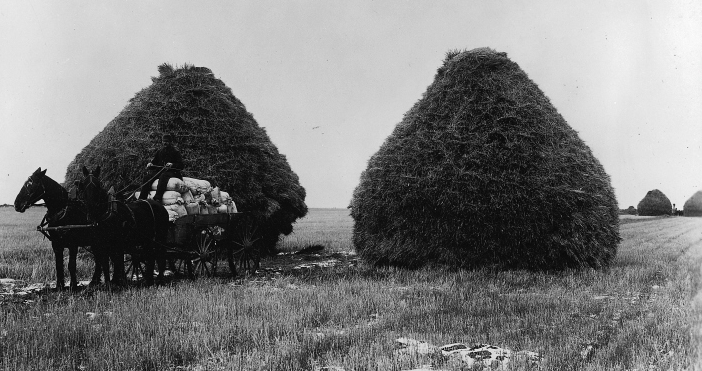 Wheat stacks and wagon load of grain in Portage La Prairie, Manitoba, Canada, 1887. Photo: William McFarlane Notman. McCord Museum of Canadian History. View-1623. Notice that a whole stack can be placed on a wagon pulled by a horse. A completed wheat stack. An instructional illustration from the 19th century. Note that the stack has a sharp point on top so that water will easily run-off of it. From The American Wheat Culturist, p. 396. Rebbi Yehuda views the case of bundling sheaves into stooks not as a separate act of bundling, but rather as a preparatory step for the final bundling into a large stack. 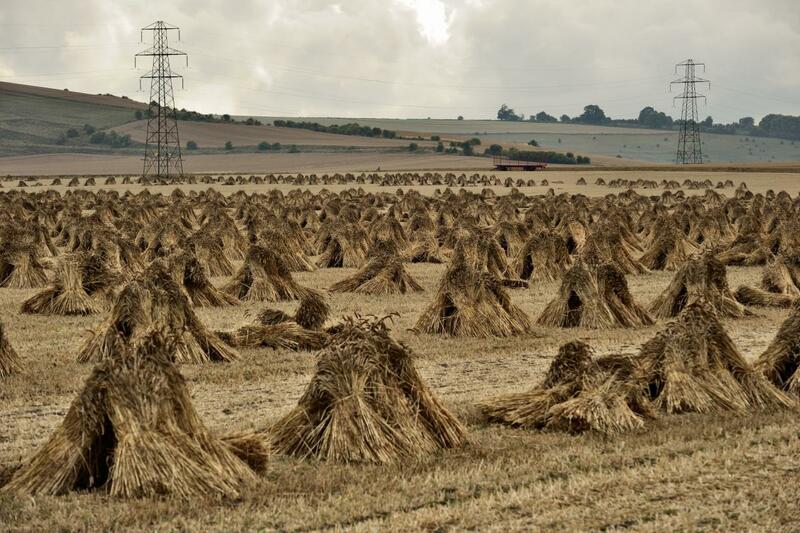 There are a few possible reason that the farmer would create stooks, before making a stack, or not making a stack at all. The stooks are made in order to dry the grain, before it is stacked, since inside a big stack the grain will not dry well, since it is not very much exposed to air. If the farmer’s field is small and he can fit all of his produce on the threshing floor, then it is probably easier for him to just carry the sheaves straight from the stooks to the threshing floor than stacking them first in the field into large stacks. If the farmer decided to bundle his sheaves not in a stack, but rather into large sheaves or so-called small heaps then he probably did so to minimize his transportation efforts from the field to the threshing floor. 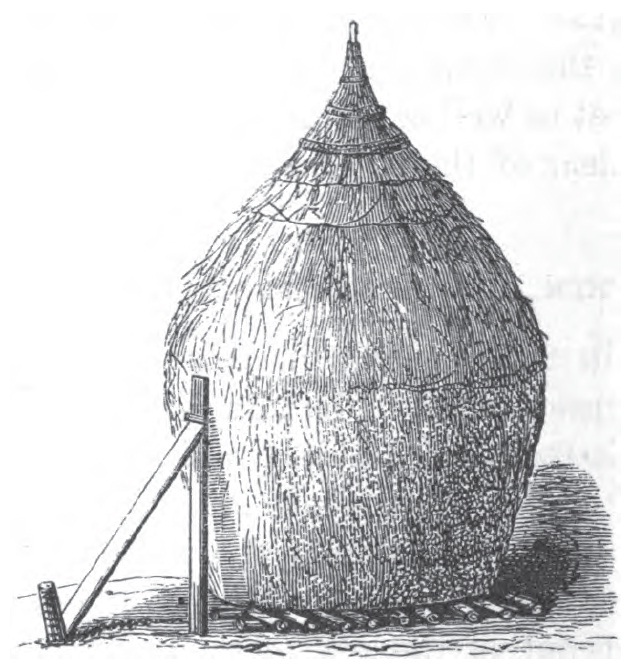 The small heaps are sized in a way that either the farmer himself or with the help of an animal, such as a donkey or a camel, can carry away one small heap at a time, which is much bigger than an individual sheaf, but not as big as a whole stack, thus reducing the amount of trips he would have to make if he was to pick up each individual sheaf and carry it to the threshing floor. Since it was a lot more common in the Land of Israel for farmers to use donkeys or camels, and not horses that pulled wagons, it made a lot of sense for farmers to transport small heaps as opposed to large stacks. Therefore Rebbi Yehuda compares this intermediate step of creating small heaps to a case where the farmer carried sheaves directly to the large stack, and seemingly completed the large stack, but then decided to bring more sheaves and push them into the completed stack. In such a case, everyone agrees that it is not considered to be a separate act of bundling, but rather it is a continuation of the act of creating the large stack. And therefore if the farmer forgot one of these last sheaves in the field they would still be considered Shikcha since they were being carried directly to the large heap. Similar to this more obvious case, Rebbi Yehuda claims that making small heaps first is all a part the greater act of heaping and therefore sheaves that are forgotten in the field while making these small heaps are considered to be Shikcha as well. I would like to suggest that when Mishna Peah 5:8 states המעמר לעמרים (Hameamer Leomarim), “a person who bundles into sheaves” it is specifically referring to making these small heaps from regular sized sheaves for the purpose of transportation on an animal. This also clearly distinguishes these heaps from the three types of stooks that the Mishna mentions, Kova, Kumsa and Charara, and from the stack, Gadish, and therefore each example of the Mishna is talking about an agriculturally distinct act. 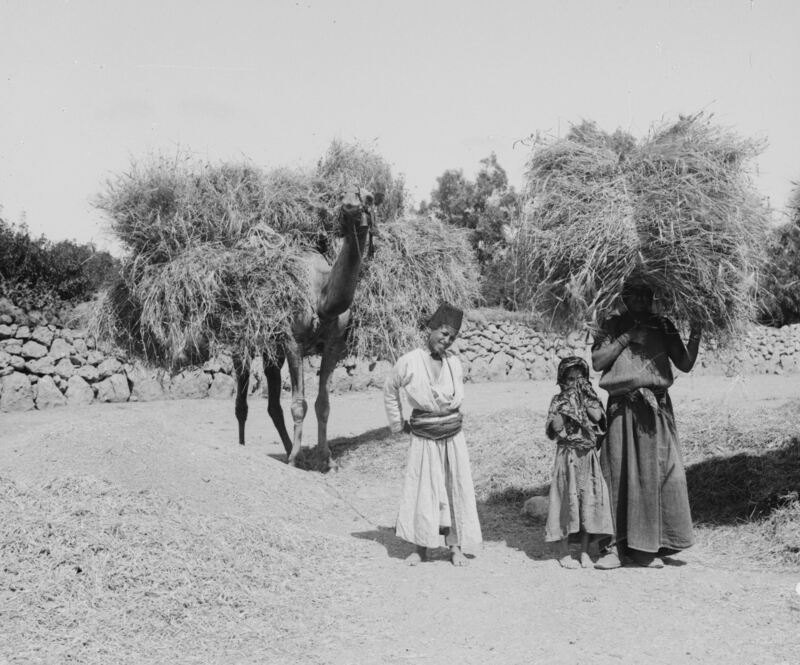 Arab farmers in Palestine transporting grain sometime between 1900 and 1920. Library of Congress, G. Eric and Edith Matson Photograph Collection, LC-DIG-matpc-01229. Notice that although the farmer is carrying only one large sheaf, the camel behind him is carrying a few such sheaves. A camel cannot transport a whole stack, which would require a wagon and probably a horse or a mule to pull it. There is a great deal of dispute regarding the last three words of Rebbi Yehuda’s statement due to various readings in the manuscripts and obscure handwriting in which it is written. Before jumping to any conclusions I would like to present to you the actual pictures of both Vienna and Erfurt manuscripts so that you can judge the difficulty for yourself. Rebbi Yehuda’s statement as it appears in the Vienna manuscript. Note that the last two words are either חררה כגדיש or חררה בגדיש and not as I have quoted them וְהַדְרַה וזוֹרֵר לגדיש. Rebbi Yehuda’s statement as it appears in the Erfurt manuscript. The word that appears to be as והדרה or וחררה has Vowelization underneath it, but it is too difficult to make out what it is. The first printed edition has the text similar to the Vienna manuscript, but they have interpreted it to read לחררה בגדיש (Lecharara Begadish), meaning “to the stook with a hole in the center inside the stack”. That reading does not make any sense what so ever. Saul Lieberman in Tosefta Kifshuta suggests that the correct reading in the Vienna manuscript is חררה כגדיש (Charara Kegadish), “the stook with a hole in the center is like a stack”, meaning that both of them qualify a forgotten sheaf as Shikcha. This reading makes more sense, but is still problematic since it has to be read as a completely separate sentence from the rest of Rebbi Yehuda’s statement. There are two different interpretations of the Erfurt manuscript reading. Zuckermandel in his edition of the Tosefta interpreted it to read וְהַהִרַה וזוֹרֵר לגדיש (Vehahira Vezorer Legadish), “and [then] made it (i.e. the stack) into a mound out and [then brought more sheaves and] pressed [them] into the stack”. This reading does not make much sense since it does not flow with the rest of Rebbi Yehuda’s statement. Also saying that “he made the stack into a mound” is superfluous since making the stack itself implies that it is made into a mound of sheaves. Therefore I have chosen the Erfurt manuscript reading as interpreted by the Bar Ilan Tosefta Project, וְהַדְרַה וזוֹרֵר לגדיש (Vehadra Vezorer Legadish), “and rounded it (i.e. the stack) out and [then brought more sheaves and] pressed [them] into the stack,” since it makes most sense in the text and makes Rebbi Yehuda’s statement flow as a single sentence.